Photograph by Shelby Prenger/The Guardian. Two years ago, Lyndsey Rhodus began planning for her dream of owning her own business. 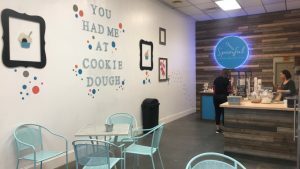 By April 2018, she achieved it, by opening Spoonful, the first edible cookie dough shop in Dayton. After visiting an edible cookie dough shop on a trip to Nashville, Rhodus felt inspired to bring the sweet treat to Dayton. There are currently 10 available cookie dough flavors, including chocolate chip, snickerdoodle, brownie batter and mint chocolate chip. All of the flavors are prepared in house by Rhodus and her two part-time employees. In order to make the cookie dough edible, the flour used in the dough is heat treated and no eggs are used. Rhodus said she wanted the shop to reflect a small farm town atmosphere. “With the revitalization of the area, it still has the cute, old town feel and small businesses here instead of chains make it a unique place to shop,” sai Rhodus. With a movie theatre across the street and a handful of restaurants just a walk down the block, Spoonful makes for a fun desert to end a day spent in Miamisburg. Spoonful is located at 36 S. Main St., Miamisburg. The shop is open Tuesday-Thursday from 12-9 p.m., Friday-Saturday from 12-10 p.m., and Sunday from 12-7 p.m.